Demos from HttpWatch, AOL Pagetest, Speed Tracer, and Fiddler. For more than two years, WebPagetest has been a leading tool for Web page performance measurement. Now WebPagetest provides visual performance information via screen capture. You can correlate screen shots with waterfall diagrams to see what the screen looked liked at each moment of a page load. What’s more, you can perform side-by-side screen capture comparisons of two or more sites, and generate stand-alone video and filmstrip comparisons. In addition, WebPagetest now provides CPU and memory utilization information during a page load, displayed, and synchronized with the waterfall diagram. Speed Tracer is a tool to help you identify and fix performance problems in your web applications. It visualizes metrics that are taken from low level instrumentation points inside of the browser and analyzes them as your application runs. I plan to give a quick overview of the Speed Tracer UI and then show off some of Speed Tracer’s new features. These include symbol de-obfuscation, full stack traces, server side traces, and integration with the Google Plugin for Eclipse. Eric Goldsmith, Operations Architect at AOL, has more than 20 years of experience providing technical leadership in the areas of product development, engineering and operations. At AOL he has led efforts to deliver the highest levels of performance and availability for top Web sites, including: AOL.com; AIM.com; and AOL Video; among others. His areas of expertise include Performance Analysis, Capacity Planning, Network Engineering, and Software Development. Prior to AOL, Eric worked for companies such as UUNet, WorldCom and CompuServe, as well as telecom and Internet startups. He holds a BS in Computer Science from The Ohio State University. Jaime Yap is a Software Engineer on the Google Speed Tracer team. He is a contributor to the Google Web Toolkit project and loves pushing the boundaries for what can be accomplished in the browser. Eric Lawrence is a Program Manager on the Internet Explorer team, author of the IEInternals blog, and developer of the Fiddler Web Debugger. I was glad to see we can now measure DOMContentLoaded, StartRender and onload! More lightning demos! I would bet I use HttpWatch at least 10 times each day. Simon has also been a leader in moving several open source efforts forward. AOL Pagetest is a great tool especially since it works with IE. It’s web counterpart WebPagetest.org is one of my most recommended performance services. Speed Tracer is new to the scene this year, but has made a big splash. 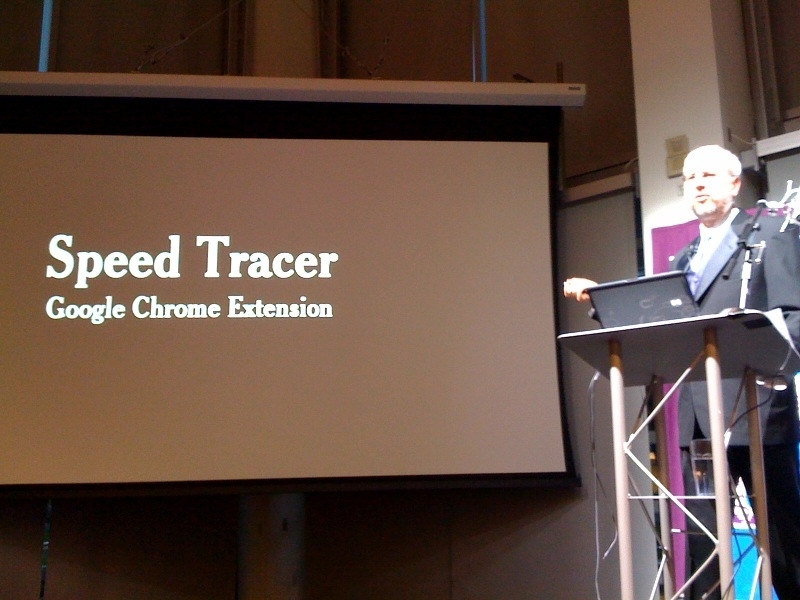 Here’s what Doug Crockford had to say: “Speed Tracer is amazing. This is what we should be demanding all the browsers provide us.” (see this photo ) Eric Lawrence knows HTTP and performance inside-and-out. He channels that knowledge through Fiddler , a longstanding favorite in the world of packet sniffers. Come hear what’s new.